Arizona has been ground zero for describing the nature and origin of metamorphic core complexes. 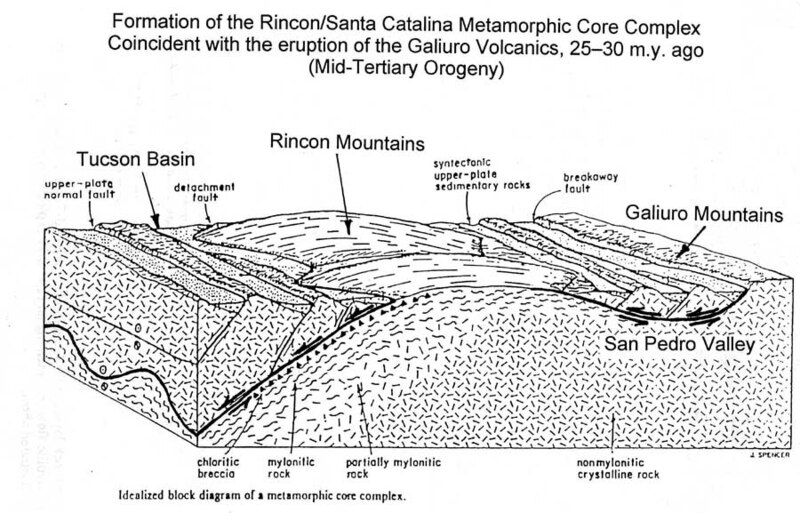 [Right, diagram of the Santa Catalina core complex. Credit, Jon Spencer, AZGS] Now, there are two new papers in the latest issue of the GSA Bulletin that add to our understanding of these features. "Continental and oceanic core complexes," by Donna L. Whitney, Christian Teyssier, Patrice Rey, and W. Roger Buck offers "a survey of ∼40 yr of core-complex literature, discuss processes and questions relevant to the formation and evolution of core complexes in continental and oceanic settings, highlight the significance of core complexes for lithosphere dynamics, and propose a few possible directions for future research." The second paper, "Development of extension-parallel corrugations in the Buckskin-Rawhide metamorphic core complex, west-central Arizona," by John S. Singleton, concludes that "Structural data from the Buckskin-Rawhide metamorphic core complex in west-central Arizona demonstrate that prominent NE-trending detachment fault corrugations are folds produced by extension-perpendicular (NW-SE) shortening during the middle to late stages of core complex extension (ca. 18–10 Ma)." The Arizona Journal newspaper in Holbrook reports that Preferred Sands, a frac sand and proppant company that purchased a sand mining business near Sanders in 2011, expanded its operations, and is on track to mine 1.3 million tons of sand in 2012 and 1.8 million tons in 2013. The company claimed a reserve of 130 million tons at the Sanders site and potential to mine 2 million tons per year. Frac sands and proppants are used to prop open fractures in rocks underground to enhance oil and gas production, following hydraulic fracturing of the rocks. Preferred Sands apparently operates on Din’e Be keyah (Navajo land), where they developed "the first green resin-coated product." The say "Preferred’s products generate significantly less dust, and have no phenol, hexamethylenetetramine, or formaldehyde leaching even under the most extreme down-well conditions, preventing undesired reactions with frac fluids in the well." The company expects to open resin plant the Sanders location in 2013. "The plant has an advanced rail load-out system, quadrupling a traditional load-out pace. Our Sanders plant is unit train accessible and directly serviced by the Burlington Northern Santa Fe Railroad." A new teaching style called inquiry based instruction focuses on student inquiry and project-based learning. It encourages students to develop creative and practical problem-solving, experts said. Kip Hodges [right, credit ASU], founding director of Arizona State University’s School of Earth and Space Exploration (SESE), was honored in a recent issue of Science magazine for his work in developing a new teaching style called inquiry based instruction that focuses on student inquiry and project-based learning. SESE says Hodges was chosen as one of 15 recipients of the Science Prize for Inquiry Based Instruction by the editors of Science magazine. He describes his work in an essay published in the Nov. 30 issue of Science, entitled, "Solving Complex Problems." "Instead of giving students information in a classroom, the idea behind inquiry based instruction is to create an environment where students have to find things out for themselves," Kip said. Residents of Arizona's Verde Valley as did others across the country and overseas heard mysterious booms earlier this month that generated speculation that they were sonic booms, quarry explosions, earthquakes, or my favorite, deceleration of an alien spaceship, breaking through the space-time continuum to avoid a squirrel. We found no record of seismic activity on the AZGS-run seismic network, and the consensus was that they were in fact, sonic booms. But now, the global conspiracy set has weighed in, concluding that all of us gummint types are in cahoots with the news media to stonewall the real explanations for the Verde Valley booms. Which are, drum roll please, either shifting tectonic plates, or explosions in Deep Underground Military Bases (DUMB) where a secret war is underway between American Patriots and our UN-run federal gummint. According to these reports, last year's magnitude 5.8 earthquake in Virginia that damaged the Washington Monument was really an underground nuclear weapon detonated during one of these furious battles. So, just when you thought it was safe to stop worrying about an apocalyptic end to 2012, we have a whole new set of DUMB ideas. Sleep tight. Video preview of Tucson Gem & Mineral Show: 2013 theme is "Fluorite"
The 59th Annual Tucson Gem & Mineral Show will be held February 14-17, 2013 in the Tucson Convention Center, with this year's theme, "Fluorite, Colors of the Rainbow." The sponsoring Tucson Gem & Mineral Society posted this video preview on YouTube. 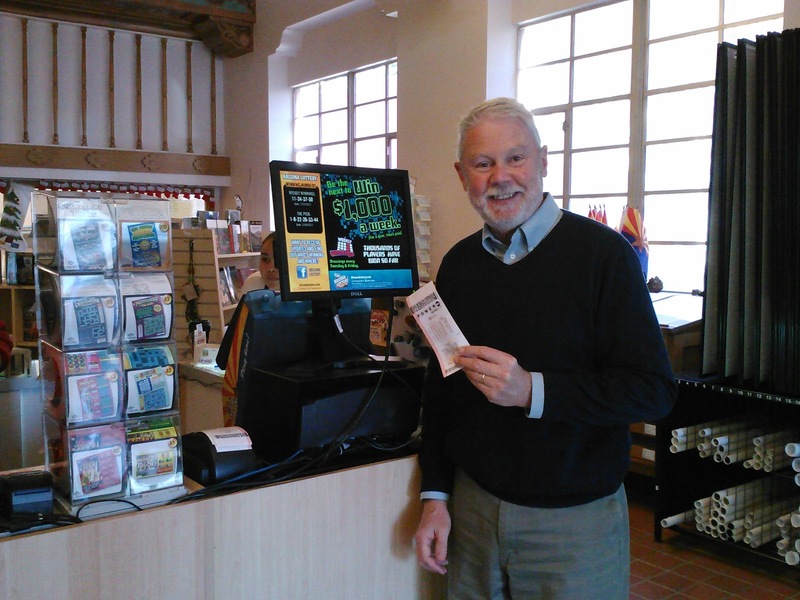 The Arizona Geological Survey began selling Arizona Lottery tickets today in our Arizona Experience store in Tucson. Apparently, we are the first state agency in Arizona to sell lottery tickets. I had the honor of purchasing the first Powerball ticket from the newly installed system today [right]. We will get a small commission off the sale of each ticket, plus a bonus when a winning ticket is sold in the store. Since 1981, Arizona beneficiaries have received over $2.8 billion from the lottery, and vendors selling tickets have gotten over $500 million. Arizonans have won over $5 billion. AZGS is releasing new earth fissure maps today for Elfrida, Croton Springs, and Three Sisters Buttes, Cochise County, and Picacho and Friendly Corners in Pinal County. The new maps come with a new format that includes a high-resolution air photo base and subsidence maps from the Arizona Dept. of Water Resources InSAR satellite monitoring program. These updated and revamped Earth fissure maps are available as free PDF downloads at the Arizona Geological Survey (AZGS) Document Repository. AZGS’s earth fissure map format has been substantially revamped to make the maps easier to use and to include subsidence maps for valleys hosting earth fissures. The new map format incorporates a high-resolution, air photo base map compiled from 1-meter resolution National Agriculture Imagery Program imagery (2010), and ground subsidence maps from the Arizona Department of Water Resource InSAR (Interferometric Synthetic Aperture Radar) satellite land subsidence monitoring program. Subsidence, as shown on the InSAR inset map, is measured in centimeters. The Picacho-Friendly Corners area, Pinal County, and Three Sisters Buttes, [above] Cochise County earth fissure study area maps are reissued in this new map format as well. Arizona Geological Survey geologists mapped about 1.6 miles (~8,800 feet)of continuous and discontinuous earth fissures in the Elfrida (~7,100 feet) and Croton Springs (~1,700 feet) areas. The Dragoon Road and Bowie-San Simon maps will be reissued in the new format in the near future. The Sulphur Springs North earth fissure study area just north of Willcox in Cochise County remains to be mapped. AZGS’s Earth Fissure Viewer [bottom map] shows the footprints of all previously mapped fissure study areas and provides links to free, downloadable PDFs. A Geographic Information System (GIS)file showing the locations of mapped earth fissure traces in Arizona should be available for download shortly. Besides posing a threat to infrastructure and livestock, fissures are an illegal dumping ground for tires, appliances, construction debris, manure and other sundry items. Because the fissures are believed to extend down to the water table, earth fissures represent a potential threat by serving as a conduit from surface runoff contaminating groundwater resources. The AZGS Earth Fissure Mapping Program will continue to update maps as earth fissures grow and new ones form. AZGS geologists will begin focusing on ways to predict where and when the fissures will appear and work with local building officials and engineers on way to mitigate existing earth fissures to minimize their impacts. Well-known Arizona geologist and mineralogist Ray Grant discovered the occurrence of two rare earth minerals never previously found in Arizona. 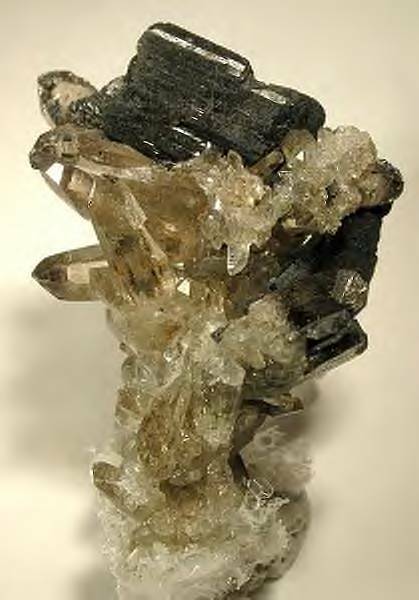 [Right, allanite on smoky quartz, White Mountain Wilderness, Lincoln County, New Mexico . Credit, Rob Lavinsky, iRocks.com, under a Creative Commons license]. Ray's report is published in the Mineralogical Society of Arizona’s The Rockhound Record (December 2012 - p15). The Kingman Feldspar mine is located a few miles north of I40 on the east side of Kingman. I was there quite a few years ago, and at that time it was very easy to drive to and could be seen from a distance. I bring it up this month, as it is location of a number of new minerals to add to the list of Arizona mineral species. There are two references, one in Rocks and Minerals, volume 82, page 236-237, May/June 2007, it is an abstract “Rare-Earth Mineralogy of the Mohave County Pegmatites, Northwestern Arizona”, and the other is in the Canadian Mineralogist, volume 50, page 815-824, August 2012 and is titled Allanite-(Nd) from the Kingman feldspar mine, Mohave pegmatite district, northwestern Arizona, USA. The above references list thorogummite (new for Arizona) as inclusions in the allanite. This is part of the source of the radioactivity. They also report aeschynite-(Y) and bastnasite-(Ce), both of which are new for the Arizona list, giving us four new minerals for Arizona. Monazite and xenotime were also found and these were determined to be monazite-(Ce) and xenotime-(Y). Previously they were just listed in the Mineralogy as monazite and xenotime. The new GeoSciML SWG has officially formed at OGC. Yahoo! This won't mean much to anyone except a tiny group of geo-geeks, but we're excited. To translate, a standards work group (SWG) has been formed by the Open Geospatial Consortium (OGC) to establish the Geoscience Mark-up Language (GeoSciML) as an open-source international standard. To put that in practical terms, Google took Keyhole Mark-up Language (KML) through the same process. KML is the interchange standard for Google Earth, that allows anyone to develop applications to run on top of their global image platform. GeoSciML is the data interchange standard underlying the US Geoscience Information Network that powers the National Geothermal Data System, and is used by the 117-nation OneGeology consortium, and many other systems. OGC approval will speed its adoption and support more applications being built on it. This SWG will focus on adapting the GeoSciML v3 GML (Geography Mark-up Language) schema to an OGC modular specification and XML implementation and adoption of an abstract specification and XML implementation specification as OGC standards. Work will be based on the GeoSciML v3 model as documented at http://www.geosciml.org/geosciml/3.0/doc/. The SWG chair is Ollie Raymond with Geoscience Australia. Steve Richard, AZGS Geoinformatics Section Chief, has been the lead US representative on the international committee developing GeoSciML over the past dozen years, and is a member of the new SWG. In 2010, the US used 2,570 million metric tons of raw materials (agriculture, forestry, metals and minerals, and nonrenewable organics), compared to 144 million tons in 1900, a more than 17-fold (1785%) increase. The USGS updated its raw materials inventory in a fact sheet that shows annual usage for the past 111 years. It's interesting to note that recycled metals total 70.5 million tons now vs none in 1900, while primary metal production is up only about 8 times to 85.4 million tons. Industrial mineral usage is up by a factor of 27 times, while construction materials overall are up nearly 34 times. The only material that decreased is wood. The USGS has released a new compilation of 144 sedimentary basins (or groups of basins) in the United States (both onshore and offshore). The basins are identified, located, and briefly described as part of a geospatial data base in support of the Geologic Carbon Dioxide Sequestration National Assessment Project. AZGS is working on assessing CO2 sequestration capacity in Tertiary sedimentary basins primarily in the Basin and Range part of Arizona as part of a DOE-funded project through the WestCarb coalition, and across the Colorado Plateau under a contract with the USGS. The USGS announcement says "This catalog of basins is designed to provide a check list and basic geologic framework for compiling more detailed geologic and reservoir engineering data for this project and other future investigations." 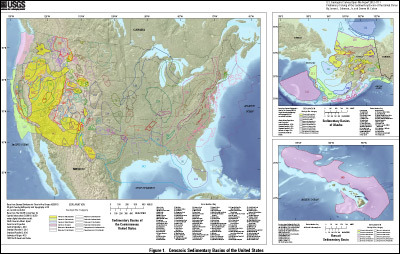 Ref: Coleman, J.L., Jr., and Cahan, S.M., 2012, Preliminary catalog of the sedimentary basins of the United States: U.S. Geological Survey Open-File Report 2012–1111, 27 p. (plus 4 figures and 1 table available as separate files) Available online at http://pubs.usgs.gov/of/2012/1111/. The Department of the Interior’s Office of Natural Resources Revenue (ONRR) announced earlier this month that "more than $2.1 billion was disbursed to 36 states as part of the state share of Federal revenues collected in Fiscal Year 2012 from energy and mineral production that occurred on Federal lands within their borders, and offshore on the Outer Continental Shelf." Most of the $2.1 billion paid in royalties to states is from coal and oil and gas production. The royalties paid to the federal government by industry amounted to $46.6 million, on mineral production on federal lands in Arizona of $358.2 million (or about 13%). However, the State of Arizona's share of the royalties is $14,171.44. The ONRR data shows that the vast majority of the production is from coal production, which is from the Black Mesa deposit on the Navajo and Hopi tribal reservations. I presume the state share of royalties coming to Arizona from the coal goes principally to the Tribes, but ONRR says "American Indian data is available only at the National Summary level, as State-level summaries reveal proprietary data." "We're still here. The world didn't end. 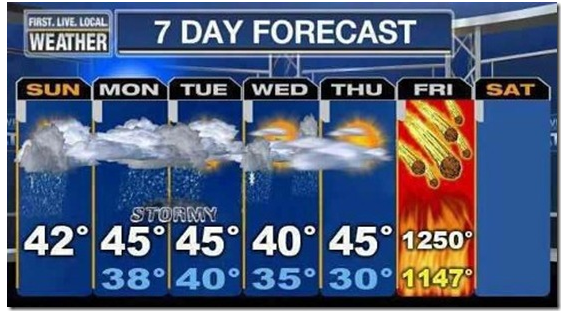 There are a lot more rumors and doomsday prophecies flying around, especially on the Web, than I realized. Dr. David Morrison, at NASA's Ames Research Center, takes aim at each of the wild ideas circulating and dismisses them. But I don't expect the doomsday proponents will pay much attention to the scientific community on this. USGS earthquake forecasting and hazards research. The United States is home to 169 active volcanoes, many of which could erupt at any time. Fortunately, volcanoes generally show signs of unrest hours, weeks and months before they erupt. Changes in gas emissions, swelling of a volcano, and swarms of small earthquakes are signs that a volcano is awakening. All of these changes can be detected with proper monitoring equipment. The USGS National Volcano Early Warning System is designed to detect these signs of unrest at the earliest stages. The USGS issues warnings and alerts of potential volcanic hazards—including imminent or ongoing eruptions, ash fall forecasts, and when eruptions have ended—to responsible emergency-management authorities and those potentially affected. These warnings prevent episodes of volcanic unrest from becoming volcanic disasters. Landslides occur in all 50 states and pose a significant risk in many areas. Scientists know landslides are likely on the west coast during its rainy season from November to March, during spring and summer thunderstorms in the western mountain states, and during hurricane season along the east coast. People at especially high risk for landslide damage are those living on or below steep hill slopes. Wildfires can lead to flash flooding and debris flow, as vegetation is removed that would have served as a stabilizing factor and the remaining burned soil is less able to absorb rainwater. Landslides can also occur from earthquakes, volcanic activity, changes in groundwater, or disturbance and change of a slope by man-made construction activities. The USGS is working with the National Weather Service on a prototype Debris Flow Warning System to help provide forecasts and warnings about what areas are at imminent risk of having a debris flow or mudslide when rainfall thresholds are met. USGS Landslide Hazards Program website. Report your landslide experiences and sightings at the new USGS “Did You See It?” website. The USGS plays an integral role in preparing for and responding to wildfires. The USGS also provides real-time geospatial support for firefighters during the events, including up-to-the minute maps and satellite imagery about current wildfire extent and behavior. Hurricane season runs from June 1 through November, with September as the peak time when they are most likely to strike. But hurricanes and tropical storms can hit at other times as well. Flooding from storms is another concern, as is drought from lack of rainfall. The USGS conducts real-time monitoring of the nation’s rivers and streams, and you can visit USGS WaterWatch to see whether river levels are higher or lower than normal. You can also use USGS WaterAlert to receive texts or emails when water levels at a specific streamgage exceed certain thresholds. The National Weather Service relies on timely and accurate USGS data to issue flood warnings, and the partnership between the two agencies runs deep. Together, the USGS, the National Weather Service and the U.S. Army Corps of Engineers are also developing flood inundation maps that show, street by street, block by block, and hour by hour exactly where the flood waters will be. What is a magnetic storm? The sun is always emitting a wind of electrically charged particles that flows outward into space. If these concentrations of solar wind are directed towards the Earth, then the magnetic field of the Earth in space (the magnetosphere) can be disturbed, sometimes for days. Large magnetic storms can cause loss of radio communication, affect global-positioning systems, damage satellite electronics and cause electrical blackouts. Damaging storms occur about 4 times a decade, with smaller events occurring more frequently. Magnetic storms can be detected up to 2 days in advance by monitoring the sun. They come in all sizes, but the largest storms tend to occur when sunspots (concentrations of magnetic energy on the surface of the sun) are most numerous. The monitoring of “space weather” conditions is a responsibility of several U.S. government agencies, including NOAA, NASA, and the U.S. Air Force. The USGS has the unique responsibility of monitoring geomagnetic activity at the Earth’s surface, close to where most of the effects of magnetic storms are actually realized. Learn more and view near-real time conditions of the magnetic field. The question to consider on December 21, 2012, and every day is: Have I done everything I can to ensure that my family and I are prepared, should a disaster strike? This includes preparing and practicing your emergency plan and building a disaster supplies kit with food, water and basic needs. Natural disasters will continue to occur, on any given day, but a more informed scientific understanding can lead to better preparedness and safer communities. The Colorado River Basin Water Supply & Demand Study just released by the Bureau of Reclamation will be a topic of discussion at the conference. Carly Jerla, Program Manager on the study will give a talk on the current and future imbalances in water supply and demand in the Colorado River Basin over the next 50 years, and the adaptation and mitigation strategies to resolve those imbalances. Click here for a complete agenda. The Water Resources Research Center 2013 Annual Conference: Water Security from the Ground Up, will be held on Tuesday, March 5, 2013, at the University of Arizona Student Union Memorial Center. Join us for an outstanding program addressing issues critical to securing our water future, from groundwater sustainability, to environmental implications of stressed water supplies, to policy options for local, regional, and federal decision-makers. Organized in partnership with the U.S. Geological Survey, the conference is open to everyone with an interest in ensuring a reliable and sustainable water supply for our future. Registration fees remain the same as last year. Click here to register. For more information on poster abstracts click here. Please share this information via newsletters, listservs and posting. Posters and meetings and booths, oh my!